Review: Pad Yatra: A Green Odyssey / It's Just Movies Review: "Pad Yatra: A Green Odyssey"
I never like to read or watch anything more than once, but this adventure doc I could watch over and over. It is the story of a 440 mile eco-trek through the Ladakh region bordering the Himalayas. Vistas of land without telephone wires, clear sounds of nature with its rushing brooks, birds and windsongs, ancient spiritual chants, inspirational words and the warm narration of Daryl Hannah blend into a cinematic spiritual journey that just makes you feel good. Leading the risky crusade of 700 followers is His Holiness Gyalwang Drukpa, a Tibetan Buddhist monk. 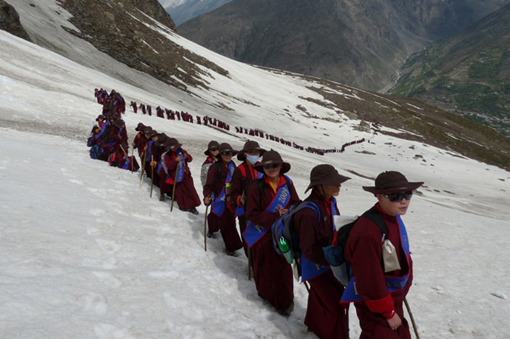 The journey is called Pad Yatra because it is a simple walk, or walking pilgrimage. In this case, it is also a monumental plastic pick-up campaign. The film begins with a sudden violent storm called a cloudburst. Because there is little vegetation, the cloudburst causes devastating mudslides that invade the villages in Ladakh with slimy gray debris laced with unsightly plastic refuse. Because the traditional way to handle garbage is through natural ground recycling, the man-made products are causing a problem. There are few waste management plans in the harsh Himalayan regions and old ways of processing left-overs, leaving them to scavengers, has been part of the culture. Plastic fights this system. One American, Carrie Lee, a LA attorney, buffed up in preparation for the eco-trek by hiring an LA trainer and getting in tip-top shape. 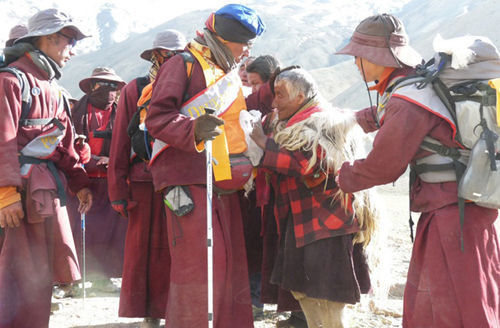 However, by the time she joined the Ladakh Pad Yatra, she realized that compared to the Buddhist nuns on the trip her preparedness was pathetic. The viewer can identify with her as she gamely puts forth her best effort every day, despite nausea and headaches from the elevation. Her pride drives her forward, but she eventually hits a wall that she cannot overcome. The increasingly volatile weather of the Himalayan region has an unusual snowfall and the temperature drops to minus 30 degrees. Locals are puzzled, but the experts in the trek report that with the rise in global temperatures there are extremes in weather irregularities. When the snow gets too deep the horses can no longer keep up. 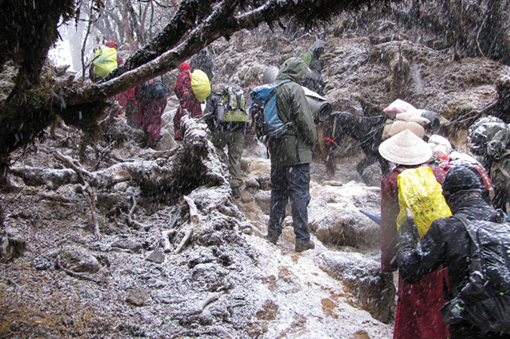 They must be left behind with their burdens, the trekkers’ stock of food. Who survives and how adds to the passion of the adventure. The monks and nuns have a schedule to keep and they are in tremendously good shape, sometimes jogging on the trail. Some of the Drukpa nuns are from a beautifully enchanting white compound in the mountains overlooking Kathmandu. They are called Kung-Fu nuns because their convent routine begins with daily Kung-Fu training. “Pad Yatra” was shot with solar power by Ngawang Sodpa, a Himalayan monk who learned through studying National Geographic films. So far the film has won ten awards, including one for best cinematography. Gorgeous and inspiring, “Pad Yatra” is a great holiday film for the whole family to watch together.